If you're going to the game, bring an old coat to donate for charity. Congrats to Chuck Kobasew on his 300th game tonight. Sturm is out of the lineup tonight. Manny in net. He's won his last 3 games, is 4-0-1 in his last 5 starts. The good Dr. Mirtle writes about projections vs. last year's performance. Bruins are 2nd in points difference, 7th in Goals for difference, and 3rd in Goals against difference. All in all, better than last year. Tonight is the second Sam Adams Bru Fest. HubHockey has another SteveDangle video, this one about the all-star game. After scoring his first NHL goal the other night, Matt Hunwick got 20+ texts. Boston.com has more on the Ference Injury. Badass. He should be back in January. Jack Edwards is into Poetry. Sick. “I think they’re definitely one of the top teams,” said the Buffalo bench boss. “Their depth up front, the fact that (Patrice) Bergeron’s back, (Phil) Kessel’s kind of having his coming-out party, (Marc) Savard’s a real good player, Sturm, great two-way player. They’ve got good depth, they’ve got a solid defense, led by a guy that’s an All-Star and he happens to be 7-foot-11 (Zdeno Chara) or whatever he is – so that’s big enough and good enough. They’re a good team and their goaltending’s been good. All aspects of their team have been good, so they’re one of the teams we’re going to have to look up to, one of the teams you’re going to have to beat. Thanks to New England Hockey Journal. 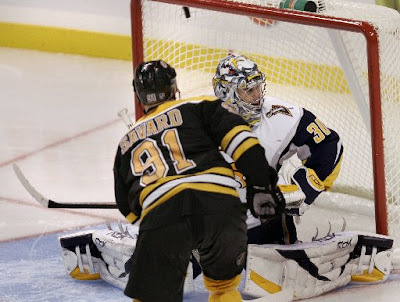 The Bruins Report: Covers the Ference injury. Stanley Cup of Chowder: "we have finally solved the mystery of the whereabouts of Peter Schaefer's missing soul patch." HubHockey: Shows off some Photoshop Skillz. Kynch's Korner: Includes a hilarious editorial cartoon. The Bear Cave: "Dennis Wideman, Phil Kessel, Chuck Kobasew, and Craig Rivet are the only four players with more than one point in the season series." NESN.com First Shift: "The Bruins have six forwards with at least 10 points: Marc Savard (21), Marco Sturm (12), Phil Kessel (12), Milan Lucic (11), Michael Ryder (10) and Patrice Bergeron (10)"
Top Shelf: "We're done with them after this game, right? Please?" Sorry, we play again on the 26th. For today's session, we have Heather B from Top Shelf. Top Shelf takes it's name from a Rick Jeanneret call, "TOP SHELF, WHERE MOMMA HIDES THE COOKIES." 1) Who's impressed you so far this season? For us? I think it has to be Thomas Vanek. He's managed to ride his good second half of last season into this season. He's looking much more confident and comfortable in his skin so far than he did most of last year - huge contracts will do that to you sometimes, I guess - and he's slowly but steadily improving his play in the defensive zone as well. He's started killing penalties some this year and was practically beaming when he scored his first ever short-handed goal last month. It's nice to see him becoming the go-to guy he's capable of being. For you? I covet Milan Lucic. I love all of Buffalo's speedy little guys but a dose of talented size would be awesome. If you guys ever want to get rid of him, let me know. 2) Obviously you'll like Rick Jeanneret best, but have you heard Jack Edwards? Sadly, I don't have Center Ice or anything like that so I never hear anyone else's announcing team. Sorry! It is what it is. It seems like there's always one or two guys who are having great seasons who get left off the ballot but as long as it's fan voting, it's going to be a popularity contest. I'm mostly in the "Give the people what they want" camp. (As long as the people aren't Canadiens fans using tricky means that is.) If a guy gets the most votes, he should play. It's just an exhibition game. I do wish the voting didn't start so early in the season though. Is that necessary? The game is forever away! 4) Does Buffalo have a local music group that represents it, akin to Boston's Dropkick Murphy's? I'm not a music person so I can't tell you how well-known they are nationally these days or how many people relate them to Buffalo but the Goo Goo Dolls have very strong ties to Buffalo. Johnny Rzenik and Robbie Takac both grew up in the area and both still have homes here. They have a music studio in these parts and Robbie in particular is very involved with the local scene and runs an annual music festival which is pretty cool. They both always speak very fondly of Buffalo which Buffalonians are suckers for. Anyone who appreciates us is a-ok in our book. 5) Who will win tonight's game? Once again, that's Heather B from Top Shelf. Thanks again to you, Heather! If anyone has a picture of Thomas punching that Sabre they always show in the Garden, please send it to me. Thanks! I will take the Murphys any day over the Goo Goo Dolls. Buffalo is a miserable second rate city.